We have followed a general pattern of capitalising the first word but not the second, e.g. Velvet bushwillow. In a few, rare, cases, we have done something different if the result so produced is ridiculous for some reason. The languages listed are as follows: Bemba, Ila, Kaonde, Kunda, Lamba, Lenje, Lunda, Lozi, Luvale, Nkoya, Nyanja, Soli, Toka, Tumbuka, Tonga: Zambia and English (Zambia). Brief details of where the type specimen came from. In Flora Zambesiaca, Zambia was divided into 6 divisions. B,N,W,C,E,S. Information as to which division each species is to be found has been extracted from Flora Zambesiaca and other published checklists. 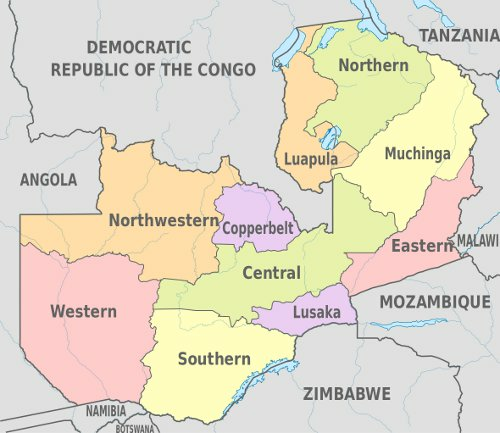 Zambia currently has ten administrative provinces, the tenth Muchinga, having been split from Northern Province recently (2011). The following map shows the current administrative provinces. Chirundu – moved from Southern to Lusaka Province. Bingham, M.G., Willemen, A., Wursten, B.T., Ballings, P. and Hyde, M.A. (2019). Flora of Zambia: Information about the species data pages.